Are you looking for the best party or tailgate dip recipe? 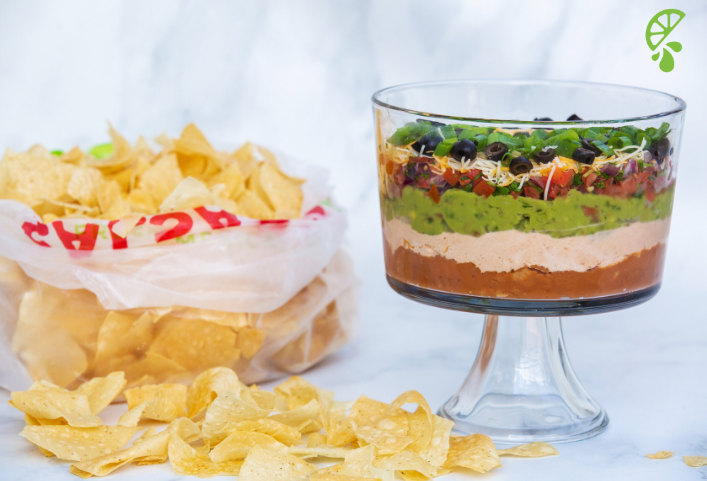 We took your favorite 7 Layer Dip and added a Salsarita’s twist, all with ingredients that you can either pick up at your local restaurant or you may already have at home.Fall, Halloween, and football means it’s party season! Between tailgates and trick or treaters, you already have enough mouths to feed so that’s why we’re keeping it simple. Serve alongside a bag of Salsarita’s addictive chips and you’ve made even the pickiest of eaters satisfied. Order the Salsarita’s items ahead online and pick up in store, any time! Spread can of refried beans on bottom layer of baking or trifle dish. Once the bottom layer is covered, mix the taco seasoning with the sour cream together in a separate bowl. Add on top of refried beans. Proceed to add guacamole on top of the taco/sour cream mixture, creating an even thin layer. Top with layer of salsa, cheese, black olives, and green onions.Serve immediately with large serving spoon and Salsarita’s chips! If you make this 7 layer dip at home for your tailgate or football watch party, we’d love to see! Tag us in your photos with #salsaritas. Want to see more recipes by Salsarita’s? Check out our past favorites here!